Russia has launched the first of a new class of nuclear-powered attack submarines. Don’t get too excited though. 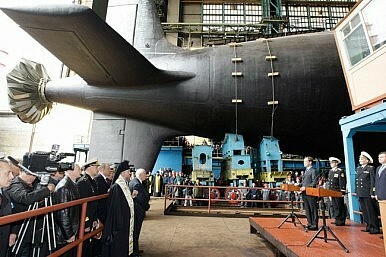 It took nearly two decades, but the first of a new class of nuclear-powered attack submarines has launched in Russia. Severodvinsk, displacing 12,000 tons, is now on sea trials. The $1-billion vessel’s launch heralds a modest recovery for Russia’s decrepit undersea fleet. Construction of Severodvinsk began in 1993 at the Sevmash shipyard in northwest Russia, but was repeatedly interrupted. ‘They ran out of money multiple times,’ Owen Cote, Jr., a Massachusetts Institute of Technology professor and undersea warfare analyst, told The Diplomat. Moscow plans to build up to nine more submarines of the Graney class over the next couple of decades, alongside 10 new ballistic-missile submarines of the Borei class. As submarines last only as long as their nuclear cores, few serve longer than 40 years. Life limitations and the slow build rate mean that Russia’s submarine fleet could decline to fewer than 20 operational vessels within the next few years, compared to around 60 active US submarines.